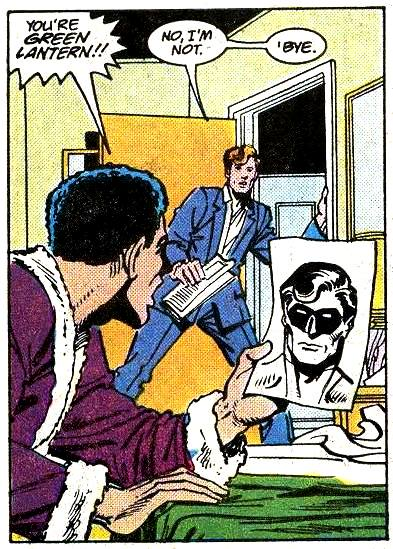 "Maintaining your Secret ID For Dummies"
7 Responses to "Maintaining your Secret ID For Dummies"
C’mon, Hal, even Supes does something with his hair. I’m not seeing it. How could a random guy with hair and facial features exactly like the Green Lantern be the Green Lantern? It just doesn’t fit. I think the black male needs to get his eyes checked. A disturbing amount of my random panels these days comes from Reddit, I must confess. Wait a minute. Green Lantern has a head shot? Who’s his agent?